Denis Ryan works in a very similar way to the original photorealists. He takes lots of photographs, collages and editsthem, enabling him to get the composition exactly as he wants it. He takes a meticulous approach to creating his compositions; he traces his final collage of photographs using a light box for accuracy, then transfers the tracing down on to mounted paper. Ryan then draws the whole image again and makes any last-minute adjustments. This long painstaking process allows Ryan to perfect every inch of the drawing before he begins to paint. STUDIED: Post Graduate study of Art Education,Hornsey College of Art.MA Fine Art, Watford Art School & Ravensbourne Art School. 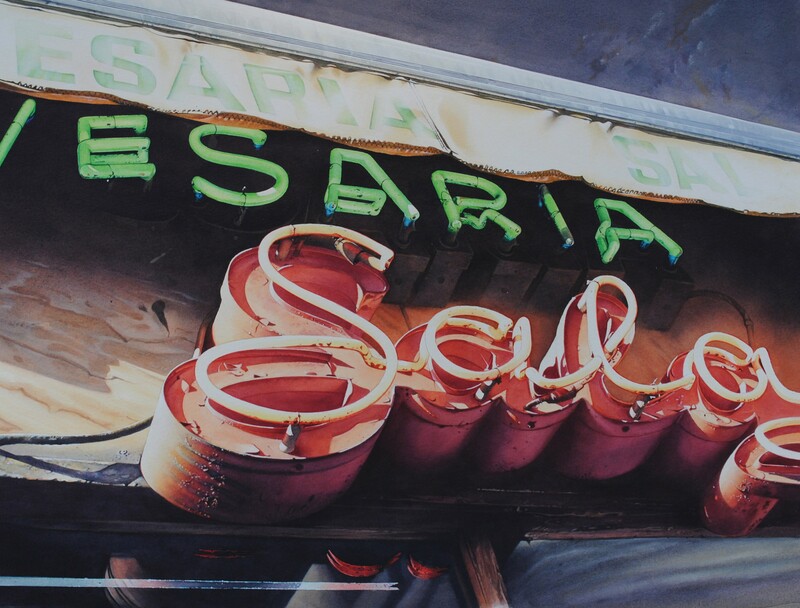 WORK: Ryan’s current series portrays neon signs from around the world.As the series continues, Ryan’s love for painting particular surfaces such as steel metal and glass is satisfied by these old neon signs. 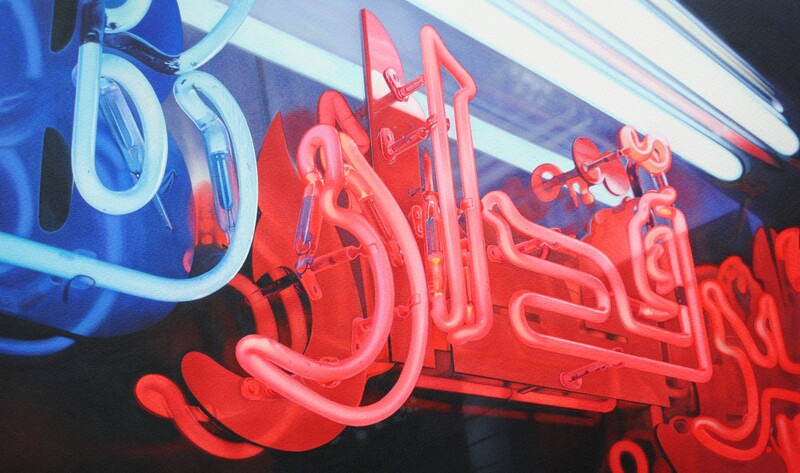 As neon signs are becoming a thing of the of the past (New York for example is losing three a day), Ryan is beginning to see his series as an archive of disappearing neon advertisements. Denis Ryan has exhibited in China, New York, Texas, Charleston, Italy, London, Aldborough, Edinburgh and regularly with the Royal Watercolour Society of which he is an elected member and chief curator of all their shows. Ryan is always looking for new ways to approach each painting in order to keep his images fresh. 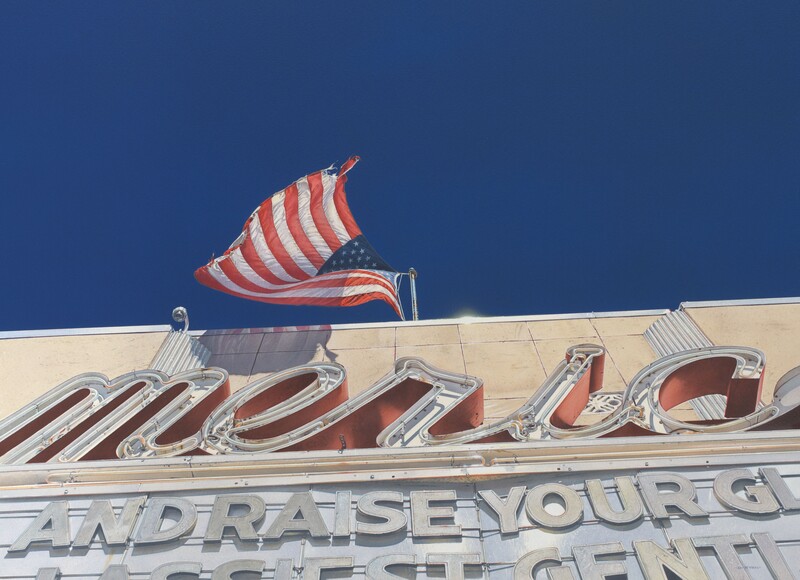 This includes paintings with multiple imagery, he combines signs and a combination of signage and areas of flat colour with a photorealist approach. This composition is based on a sign Denis Ryan found in Nice, France. To create this particular work Ryan focused on two series of photographs he had taken based on their design, colour and age. 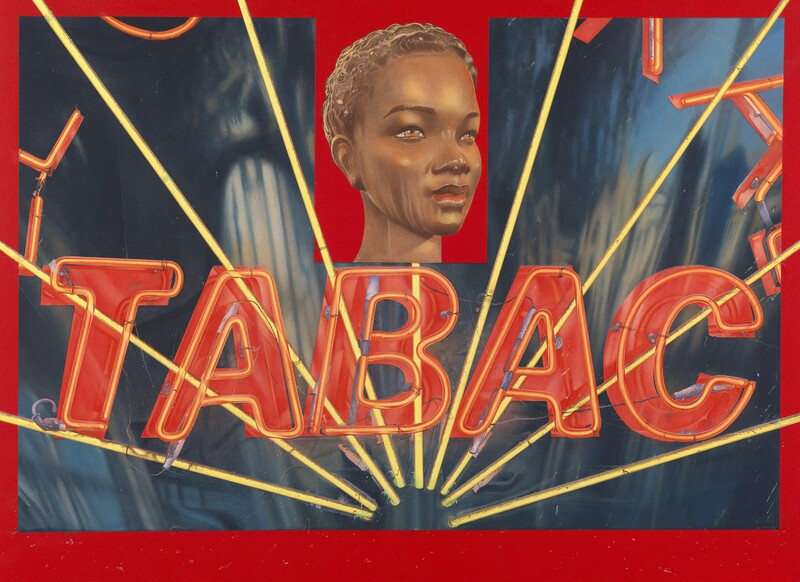 The featured mannequin resembles a Caribbean girl, which against the word ‘Tobac’ creates a new narrative suggesting controversial ideas around the history of tobacco plantations. The black background to the sign reflects the trees and buildings opposite thus creating a multilayered painting with varying surfaces and textures. 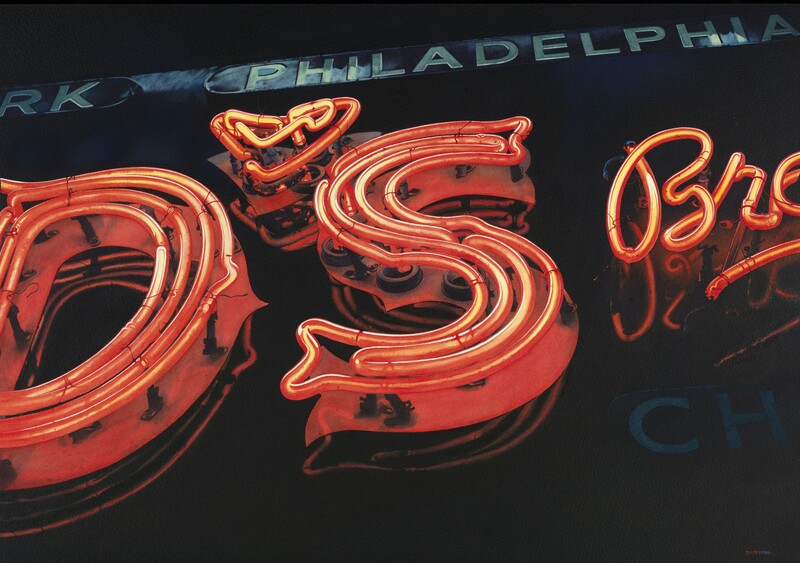 This painting is based on a sign Denis Ryan saw north of the old town in Charleston, USA. He was attracted to the type for its perfect style and age. He waited until the sun was in prime position allowing him to capture the light shining through the flag. Another prominent segment of the painting is the bold blue sky which took about 18 coats of paint to get the density it needed. Ryan started the painting around the same time as the shocking shootings in Charleston. Therefore, he likes to think of this painting as a tribute to all the wonderful people he met during his trip there. Denis Ryan’s father was a commercial artist who mostly painted scenic backdrops for the theatre. As a boy, Ryan spent his summer holidays working at a scenic studio in Soho;cleaning brushes, mixing paint and painting props. In his early career, he worked commercially in film animation and illustration. All his experience working in those fields has given him the skills and techniques he incorporates into his paintings. He mostly uses watered down acrylics and builds up the paintings, occasionally using an airbrush, his technique has developed organically over the years and is now second-nature to him.